Some of you guys were asking me about how and what cream products I use to contour my face. I have really been enjoying the L.A. Girl USA Cosmetics Contour Stick. When it is time to contour I like to use both cream and power products, everything depends on what mood I am in. I really like working with these cream sticks because they glide very easily on my skin, they almost feel like butter on the skin. 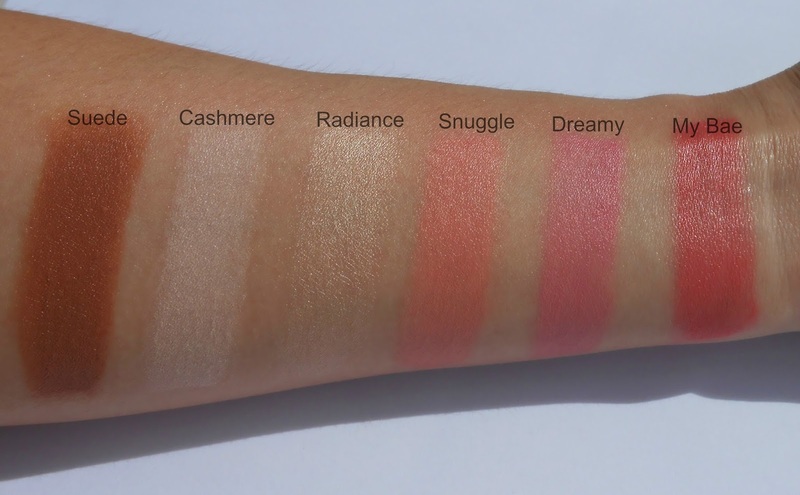 They have a very creamy light texture which makes them very easy to apply and blend. I like to apply them with my beauty blender but you can use a brush as well. These come in a twist up package and each one contains 0.2 oz of product. They have a different selection of 10 blushes, 3 bronzers, and 3 highlighters. After I am done with my foundation, I apply all 3 products at once (Bronze, Blush, and Highlighter) and blend them all together at once. I personally prefer this way because I think the final result looks much more natural but you can use them individually as well. I've never heard of contour sticks before! I've used lipstick like this but that's it. I'll have to give these a shot and try your method to put it all on and rub it in at once. Thanks for the tips! I have actually never used contour sticks. I have always wanted to try. These look awesome. Need to try them. I have never heard of these! The look beautiful and I need something for the holidays with all the parties we go to! It would be awesome to experiment with these colors. I think the Radiance color could look great with a number of fall looks. I've been playing around with a contouring stick for a while now... I think you might remember that. These look nice. Have you ever thought of doing tutorials!? I do not use much make up, but if I do, I think I would go for this LA Girl USA Cosmetics. I like the colors. They are sure to give us that natural look. Thanks for sharing! These LA Girl USA Cosmetic velvet contour sticks sound and look amazing. Radiance and Dreamy are the ones I would love to try. I've not heard of contour sticks either. I'll have to try them out! So cool, I will have to try these out! I use other things to contour but, this would be easy. This is the first time that I've seen or heard of contour sticks and they look so cool. Love the colors too. Bet my sister would love them. This is my first time to hear about contour sticks. I'll have to see if the mall here have something like that so that I can try it. I havne't seen these contour sticks yet!! I need to find these!! I love couture sticks. I didn't realize that there was another brand out there besides the one I currently use. Thanks for sharing. I really like this color pallet. These are just the right colors for me! Contour sticks?? How neat! I'm definitely going to be checking those out for sure! I never heard of these before but they sound awesome! I will have to try some of these out. Great review! I love how vibrant and highly pigmented those colors are! I'll have to say my favorite is the Radiance. I tried contouring once but the bronzer I chose gave me an allergic reaction. I will have to look into these.